of neighboring cities and urban centers. Famed for its "Golden Mile"
of beaches, it has often been a hot spot for tourism and laid back nightlife. It is one of the most liberal regions in Sri Lanka and plays host to the island's annual gay pride and Rainbow Kite Festival. Approved by the Sri Lanka Tourism Development Authority. 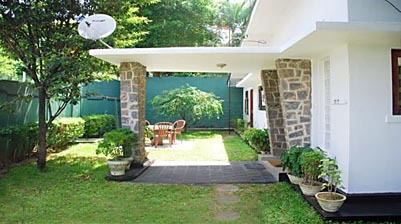 area 33 km from Colombo International airport and 10 km from Colombo City. It's 3 minutes away from famous Mount Lavinia beach and 5 minutes walk to the Mount Lavinia Hotel. Restaurants, Hotels, Take Away outlets, Pubs, Odel, KFC, Banks, Shopping Malls, Super Markets, Taxi stand, Places of worship. Railway and Bus to Colombo City, North or down South. 3 minutes walk to the Bus stop in the main road, Galle Road. 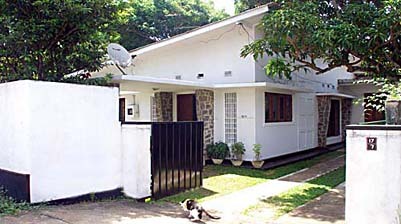 10 minutes walk to Mount Lavinia Railway Station. ​- There are three AC rooms available on request. with satellite, Laundry and Ironing facilities. Garden to relax in. - Internet available on request. You can follow us on Facebook with a click to like our page.